Today I have a guest post for you from Saisha Potts who writes on behalf of www.cafelamoda.co.uk, the social fashion site. Visit Cafe La Moda to find all of 2012's beauty trends in one place. There’s no compromise with 2012’s official hottest colour – and it is hot! Since colour specialists Pantone named Tangerine Tango the colour to watch for 2012, you’ve probably been wondering how to make the “spirited reddish orange” part of your look for this year. 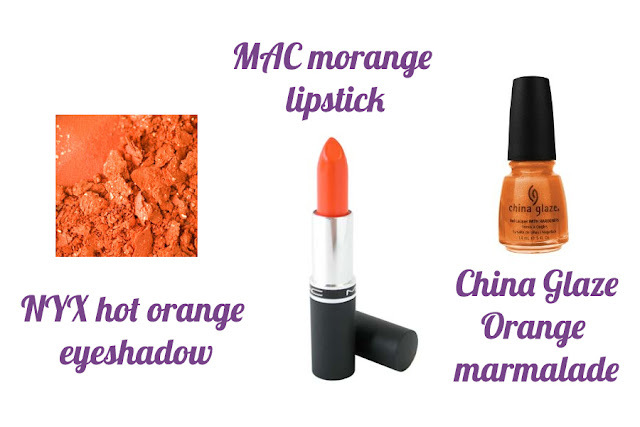 And since it’s been seen everywhere from the catwalks to the high street and the makeup aisle, you should have no trouble working a bit of zingy orange into your life. Forget the LBD if you’re out on the town this spring – go for a little orange dress instead and be so on-trend it hurts. It’s a bold statement, but the great thing is that orange flatters almost any skin tone, so wear it with bags of confidence, and you can’t go wrong. With the colour nothing short of eye-catching, the lines of the dress can be really simple, or just a bit more cute – New Look have a fab lace detail cut-out back dress with a contrast detail belt (New Look, £29.99). If you’re not ready to go all-out with the orange vibe, why not start small with accessories? Whether it’s hats and gloves for out in the cold, a clutch bag for a night out, or even orange Oakleys, you can casually acknowledge the tango trend without going the whole nine yards. Better still, accessorise a whole outfit, starting with orange snake wedge courts (DorothyPerkins, £45) or, if you’re feeling a little more flush, Tory Burch flats RevaPatent orange leather ballet pumps (£82.50). Add the ASOSacross-the-body leather bag in two-tone orange (ASOS, £35), and a Betty Jackson orange ombre scarf (£14 at Debenhams)… and voila: tangerine dream! Where’d you get those peepers? If you’ve got baby blues, then your eyes really are the place to make Tangerine Tango work for you – orange eyeshadow looks amazing with blue eyes! If you don’t believe me, try it for yourself. If you have blue eyes make them stand out with a dramatic, bright orange - NYX do an incredible bold single eyeshadow called hot orange – or for the brown-eyed girls out there, blend with coppers and browns for a softer, smokier look. Yes, we used to think orange lippie looked tacky, but you’ve only got to look at the catwalk shows for spring 2012 to see that that’s just not true – so it’s time to pucker up and try it for yourself. The trick with orange is – the lighter your skin tone, the darker the shade you should go for. Don’t overdo it with the rest of your face if you’re going with tango-toned lips, though – just some cat-eye eyeliner should do it, or for a more out-doorsy look, team the orange lips with some layers of tone-matched blush, shaping the cheeks. Of course, the easiest way to try out whether orange works for you is on your nails. Fun and flirty, you can’t go wrong with orange nails, so if you’re not ready to go all out orange, dip your toes (or fingers) in the trend with something like China Glaze’s Orange Marmalade – with a gold fleck shimmer for extra sparkle. I'm currently sporting orange nails, it's nice to know I'm wearing being fsahionable without realising haha! So pretty! That color is perfection! I LOVE orange! I think it's one of my favourite colours, especially now I have really dark brown/black hair, I missed wearing it so much when I was bright red ha-ha. Love that dress + bag and ooh that lippy! So tempted lady!